Yan, L. Y., Li, S. Y., and Song, X. L. (2017). "Preparation of paper strengthening agent by esterification of cellulosic fines," BioRes. 12(1), 469-477. Paper strengthening agents play an important role in the papermaking industry with the increase of secondary fiber applications. The objective of this study was to create a dry-strength agent by esterification. The fines from the pulp were collected and modified with trimesic acid and citric acid, respectively, to obtain the dry-strength agent. The influences of acid type and dosage on the enhancing effect were investigated. Compared with the control sample, the physical properties of paper sheet were improved after adding modified fines. The properties of recycled paper were also improved by the modified fines. When the dosage of citric acid agent was 7%, the effect on paper properties saw the greatest improvement. The tensile index, burst index, and folding endurance were increased by 60.3%, 18.3%, and 146.2%, respectively, compared with the control. The improvement of paper properties was due to the increase of carboxyl content in the modified fines. Based on the findings, it can be concluded that the esterification is an effective approach for producing paper dry-strengthening agent. With the development of digital technology and the Internet, digital resources have become a major source for accessing knowledge and information. Nevertheless, paper literature resources are still the main carriers of information and culture. The Chinese pulp and paper industry has always been important, but there is a continuous challenge to conserve natural resources. Therefore, more and more secondary fibers, fillers, and high-yield pulps have been applied in this industry (Ashori and Nourbakhsh 2008). Around 50% of paper produced is made from recycled fiber, which has resulted in a deterioration of the paper strength properties (Ashori and Nourbakhsh 2008). The strength properties of paper are extremely important for manufacturers and end users as well as in recycling (Yang et al. 2004; Ali et al. 2005). Thus, the strength of paper products should be improved, especially those produced by recycled fibers. Traditional methods for increasing the strength of recycled paper involve either beating the fibers or the addition of paper strength additives. Beating fibrous raw material is complex but is the most effective for all papermaking processes. Dienes et al. (2004) studied the PFI beating of chemical wood pulps and found that it had a positive influence on the pulp, but it was a very costly process in terms of energy consumption (Dienes et al. 2004; Chen et al. 2010). Strengthening agents can overcome these drawbacks (Hubbe 2006). However, the effect of the traditional paper strengthening agents on recycled fibers is often insufficient, prompting research in new additives to strengthen recycled fibers. The most commonly used paper strengthening agents are polyacrylamide, starch, chitosan, and other polymers (Watanabe et al. 2004; Lofton et al. 2005; Wang and Zhang 2014). Starch is currently the most widely used dry-strength agent because of its relatively low price and high performance. Starch has an abundance of hydroxyl groups, which form hydrogen bonds with wood fibers to improve paper strength (Marton 1996; Yan et al. 2005). In practical applications, starches are often modified with a cationic charge or with amphoteric starches to increase starch retention. However, starch modification usually increases the cost of starch by at least $500/ton (Lin et al. 2004; Yan et al. 2005). Lin et al. (2004) prepared cassava phosphate starches with several different phosphates as an esterifying agent; the dosages, mass ratios of the phosphates, and the amount of urea all had a significant influence on the substitution degree of the phosphate starches and the reactions. Zhang et al. (2004) synthesized a series of cationic starches with cornstarch, methacryloyloxyethyl trimethylammonium chloride (DMC), and acrylamide (AM). The results showed that the reinforcing effects of the cationic starch were closely dependent on its molecular structure. Other potential strengthening agents include carboxymethyl cellulose and amphoteric polyacrylamide. The carboxymethylation of fiber surfaces benefits the strength of paper made from those pulps (Hubbe 2006; Duker and Lindström 2008; Duker et al. 2008; Song and Hubbe 2014). Although all kinds of strengthening agents may significantly improve the papermaking processes and paper properties, high costs make it difficult to apply these strengthening agents commercially. Thus, new paper strengthening agents with excellent strengthening effects and low cost are needed. As an important component of cellulose material for the paper industry, fines in pulp have systematic effects on paper properties. Generally, fines decrease thickness, bulkiness, and porosity of paper while improving tensile strength, formation uniformity, and smoothness, which in turn affect brightness, color, sizing properties, and other optical properties. During white water recycling, the fines in white water will effect the operation of the paper machine and paper properties. Accordingly, the fines in white water are usually recycled and added into the pulp for papermaking. For improved tensile strength and low cost, the fines can be modified with suitable chemical agents to prepare the paper strengthening agent. In this paper, novel paper strengthening agents were developed using fines and polybasic acid. Aqueous solution polymerization was used to synthesize modified fines. The trimesic acid-modified fines and the citric acid- modified were directly added into pulp to explore the strengthening effect on paper. The aspen kraft pulp used in this study was provided by the Yue Yang Forest & Paper, Hunan province, China. The kraft pulp was prepared under the following conditions: sulfidity of 21.8%, active alkali content of 15.2 g/L, maximum temperature of 168 °C, heating rate of 1.8 h to 2 h. Under these conditions the yield was 45%, and the beating degree was 40 °SR. The fines were obtained from beating kraft pulp and screening out with 100-mesh sieves. Trimesic acid was a reagent grade powder supplied by Sigma-Aldrich (Shanghai, China), and citric acid was supplied by Xilong Chemical Co., Ltd. (Guangzhou, China). First, 4 g of fines (dry matter basis) and 200 mL distilled water were added into a 500 mL three-necked flask. The mixture was dispersed by stirring with a glass rod. Trimesic acid (final concentration 4%, 7%, 10%, or 13%), and NaH2PO2 (4.5%) were added into the flask, which was placed in an oil bath. The mixture was maintained at 25 °C for 2 h and then heated to 85 °C for 30 min. As the reaction progressed, the mixture was stirred at 160 °C for 30 min. Finally, the product was filtered and washed with 100 mL of distilled water at room temperature. The product was named trimesic acid-modified fiber (TMF). When the modified agent was citric acid, the reaction process and conditions were the same with that of preparation of TMF, and the product was named citric acid-modified fiber (CMF). A 1.88 g handsheet was produced according to standard GB/T 451.2 (2002). The materials were added in the following sequence: 1.0% TMF then 0.5% Al2(SO4)3; the pH was adjusted to 5. Some handsheets were soaked in water for 24 h at room temperature and then beaten and made into handsheets again. The physical properties of handsheets were tested according the standard methods GB/T 454 (2002), GB/T 12914 (2008), and GB/T 457 (2008). 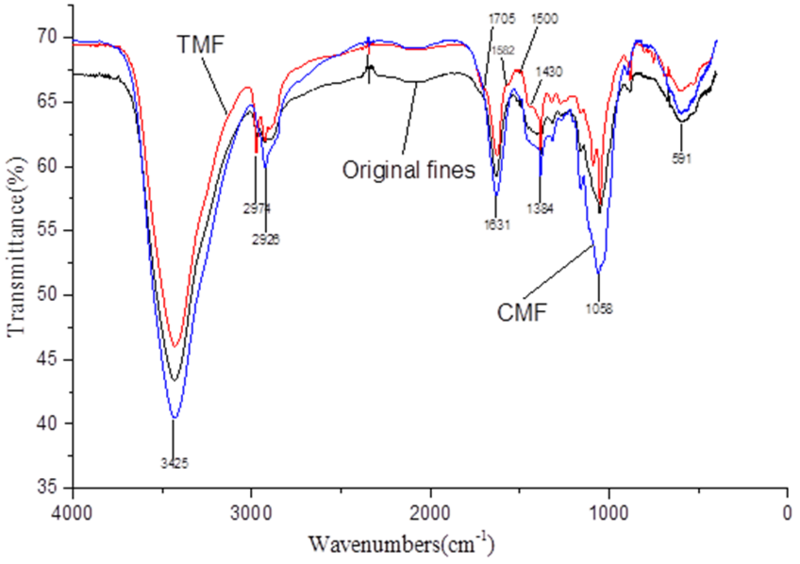 The FT-IR spectra of fines and acid-modified fines were obtained on a Spectrum-100D FT-IR spectrophotometer (PerkinElmer, Fremont, USA) in the range of 4000 cm-1 to 400 cm-1. The sample was combined with solid KBr. The mixture was oven-dried, ground into powder, and pressed into a tablet. The carboxyl contents of the fines or modified fines were obtained by conductance titration (Katz et al. 1984). The contents of C, H, and N were determined with a Vario EL III instrument (Elementar, Germany). The oxygen content was calculated using the total of all the elements subtracting the C, H, and N contents. 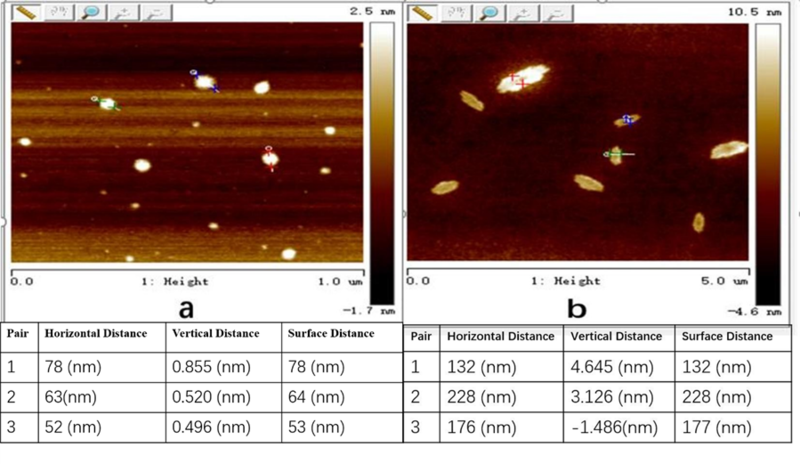 The images of the paper cross-sections were obtained using an S-3000N SEM device (Hitachi, Tokyo, Japan) after a gold spraying process. The TMF, CMF, and original fines were analyzed with a Shimadzu SPn9000 scanning probe microscope (Tokyo, Japan). The samples were diluted into a 1% (m/v) suspension, and then one droplet was dried on the surface of a wafer. Table 1 gives the elemental composition of the original fines and modified fines. As shown in Table 1, the hydrogen content in both the TMF and CMF remained almost unchanged with the increasing dosage of acid. The carbon contents of TMF increased initially and then decreased, while the carbon contents of CMF continuously increased. In both cases, the oxygen contents decreased initially and then increased. Compared with the original fines, the carbon contents of CMF and TMF increased. This result was due to the introduced groups, which had higher carbon contents from trimesic acid or citric acid. Because of the higher carbon contents in trimesic acid, the TMF had higher carbon contents than CMF. The result indicated that trimesic acid and citric acid successfully reacted with the hydroxyl groups of the fines. The carboxyl contents of TMF, CMF, and original fines are presented in Table 2. The carboxyl contents of the modified-fibers (TMF and CMF) were increased from the original fines. When the dosage of the acid agent was increased, the carboxyl contents of both the TMF and CMF increased. Polyprotic acid reacted with fines, which increased the carboxyl group contents in the modified fines. The FT-IR spectra of the original fines, TMF, and CMF are illustrated in Fig. 1. The FT-IR spectra of the original fiber, TMF, and CMF did not change. The most prominent peak at 3425 cm−1 was due to the O-H stretching, 2926 cm−1 and 2974 cm−1 was due to the C-H stretching, 1620 cm−1 to 1635 cm−1 carbonyl (C=O) was due to the antisymmetric stretching, and 1384 cm−1 was due to the C=O symmetric stretching (Kemp 1975). The peak at 1058 cm−1 originated from C-O stretching. The increasing band of TMF at 1705 cm−1 was due to the presence of carboxyl groups, which was consistent with the findings in Table 2. The peaks in the TMF spectrum at 1430 cm−1, 1500 cm−1, and 1580 cm−1 originated from benzene rings, which are from trimesic acid. Regarding the ratio of the peak at 3425 cm−1 (OH) to the peak at 1384 cm−1 (C=O) of original fines, TMF and CMF were 3.71, 2.86, and 2.78, respectively. These results show that the amount of C=O of modified-fibers was greater than that of original fines. Thus, the carboxyl group content in the modified-fibers is increased by esterification, and the carboxyl group content in the modified-fibers is increased by esterification. Table 3 shows the effect of dosage of acid agent, used in treatment of the fines, on the paper properties. With increasing acid dosage, the density exhibited only a slight change, while tensile index, burst index, tear index and folding endurance increased. For TMF, as the dosage of trimesic acid increased, the tensile index, burst index, and folding endurance of the paper initially increased and then decreased, while the tear index exhibited the opposite trend. For CMF, as the dosage of citric acid increased, tensile index, burst index, tear index and folding endurance first increased, and then decreased. When the acid dosage reached a certain value, the effects on the paper properties were the best. When the dosage of trimesic acid was at 10%, the tensile index, burst index, and folding endurance increased by 57.9%, 11.1%, and 78.3%, respectively, compared with the control. However, the best dosage of citric acid agent was 7%, where the tensile index, burst index, and folding endurance increased by 60.3%, 18.3%, and 146.2%, respectively, compared with the control. The improvements in the paper properties were due to the increasing carboxyl group content in the modified fines, which can increase the hydrogen bonding between fibers. The paper properties of CMF were much better than for TMF. This result may reflect the higher number of hydrophilic groups in CMF, which increase the bonding force between fibers. Note: The samples were prepared with 1.0% TMF or CMF and 0.5% Al2(SO4)3·18H2O. The pH was adjusted to 5. The standard deviation was less than 5%. The effects of TMF and CMF on the properties of recycled paper are presented in Table 4. Adding 1% TMF or CMF into the papermaking process improved all properties except for density. Compared with the control, when the dosage of trimesic acid was 10%, the tensile index, burst index, and folding endurance increased by 10%, 7.0%, and 45.8%, respectively. When the dosage of citric acid agent was 7%, the tensile index, burst index, and folding endurance increased by 7.7%, 15.5%, and 155.9%, respectively. However, the performance of CMF was better than TMF. It was clear that the modified fines in the fiber from previous papermaking were able to improve dry strength properties of recycled paper. Note: The samples were prepared with 1.0% TMF or CMF and 0.5% Al2(SO4)3·18H2O. After all Paper additive’s addition, the pH was adjusted to 5. The standard deviation was less than 5%. Figure 2 illustrates the SEM cross-section images of paper without additives, with TMF, and with CMF. The cross-section image of the original paper was less dense than that of paper with TMF or CMF, and the fibers in the paper were combined more closely after the addition of the paper strengthening agent. Hence, the modified fines improved the inter-fiber bonding. It was obvious that the inter-fiber bonding of paper with CMF was better than the paper with TMF, probably because CMF contains more hydrophilic groups than TMF. The AFM images of particle sizes of TMF and CMF are shown in Fig. 3. Most particles of modified fines were of nano-size. Because nanomaterials are known to improve the properties of paper, the improvement of paper properties by CMF and TMF was due to the increased carboxyl content and the properties of nanomaterials. Fines can be made into an efficient dry-strength agent by esterification with tribasic carboxylic acid. When adding 1% TMF (trimesic acid dosage of 10%) into the pulp, the tensile index, burst index, and folding endurance of paper increased by 57.9%, 11.1%, and 78.3%, respectively, compared with the control. When adding 1% CMF (citric acid dosage of 7%) into the pulp, the tensile index, burst index, and folding endurance of paper increased by 60.3%, 18.3%, and 146.2%, respectively, compared with the control. TMF or CMF also improved the properties of recycled paper. SEM micrographs illustrated that TMF and CMF enhanced inter-fiber bonding in paper. The improvement of paper properties is the comprehensive result of increased carboxyl content and the properties of nano materials. The authors thank the National Natural Science Foundation of China (31470605) for financial support. Duker, E., Ankerfors, M., Lindström, T., and Nordmark, G. G. (2008). “The use of CMC as a dry strength agent – The interplay between CMC attachment and drying,” Nordic Pulp and Paper Research Journal 23(1), 65-71. Duker, E., and Lindström, T. (2008). “On the mechanisms behind the ability of CMC to enhance paper strength,” Nordic Pulp and Paper Research Journal 23(1), 57-64. GB/T 451.2 (2002). “Paper and board – Determination of grammage,” Standardization Administration of China, Beijing, China. GB/T 457 (2008). “Paper and board – Determination of folding endurance,” Standardization Administration of China, Beijing, China. Hubbe, M. A. (2006). “Bonding between cellulosic fibers in the absence and presence of dry-strength agents – A review,” BioResources 1(2), 281-318. Katz, S., Beatson, R. P., and Scallan, A. M. (1984). “The determination of strong and weak acid groups ID sulfite pulps,” Svensk Papperstidn 87(6), 48-53. Kemp, W. (1975). Organic Spectroscopy, MacMillan Press Ltd.
Lofton, M. C., Moore, S. M., Hubbe, M. A., and Lee, S. Y. (2005). “Deposition of polyelectrolyte complexes as a mechanism for developing paper dry strength,” TAPPI Journal 4(9), 3-8. Lin, H. M., Lu, Y. D., and Wu, Z. H. (2004). “Preparation of phosphate starch,” Paper Chemicals 16(4), 23-29. Marton, J. (1996). “Dry-strength additives,” in: Paper Chemistry, J. C. Roberts (ed. ), Springer, New York, NY, pp. 83-97. Wang, J., and Zhang, J. (2014). “Application status and research developments of paper dry strength agents,” Thermosetting Resin (3), 53-58. Watanabe, M., Gondo, T., and Kitao, O. (2004). “Advanced wet-end system with carboxymethyl-cellulose,” TAPPI Journal 3(5), 35-45. Yang, D., Li, H., and Li, X. (2004). “Study on the cationic emulsifying dry strength agents for paper,” Shandong Chemical Industry (1), 3-5. Zhang, H. W., Zhu, Z. J., Tang, A. M., Chen, G., Liu Y. Y., and Xie G, H. (2004). “Synthesis of cationic starch and its reinforcing effects on paper,” China Pulp & Paper 23(10), 21-23. Article submitted: September 20, 2016; Peer review completed: November 6, 2016; Revised version received and accepted: November 13, 2016; Published: November 22, 2016.